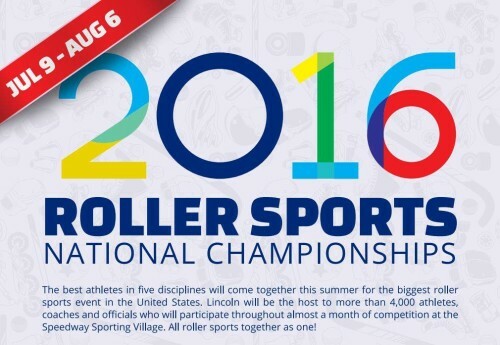 USA Roller Sports has finalized the schedule for the 2016 Roller Sports National Championships, to be held this year at the Speedway Sporting Village in Lincoln, Neb. USARS Roller Derby will officially kick things off on July 14 and 15 with Derby Nationals. The other USARS disciplines, including rink hockey, speed skating, figure skating, and the newly-added slalom skating, will hold their championship events under the same roof in the weeks following, up through August 6. The mid-summer date for roller derby marks a major shift for USARS, which had previously held the competition during the late summer or early fall…right around the time of the WFTDA playoffs. USARS had initially thought that putting on its tournament during the WFTDA season would get more people watching and generate more interest in its brand of roller derby, but declining participation due in some part due to player conflicts with those same WFTDA playoffs—only four teams contested the championship last year—made it unrealistic to continue with that plan. It’s unknown at this point how many teams may make the trip to Nebraska in July, though it is expected that the reigning and undefeated 3-time USARS derby national champions, the Oly Rollers, will be back to defend once again. There will be a lot more roller derby played than just the two days of USARS derby nationals, however. Sharing the same venue with USARS, the JRDA will kick off a full week of roller derby on with the 2016 JRDA Championships, starting July 9. The top-ranked junior teams from around the country will do battle for titles in two divisions. Many of those junior skaters will stay in Nebraska and participate in the roller derby portion of the 2016 AAU Junior Olympic Games, immediately following on July 12 and 13. The event, which came about through a partnership between the AAU, the JRDA, and USARS, will feature a selection of elite regional and international teams going for the gold in the first-of-its-kind competition. Further details about the teams participating at JRDA Championships, the Junior Olympics, and USARS Roller Derby Nationals, will be made available in the months ahead. Roller Derby Notes will have a full preview of USARS Derby Nationals in early July.